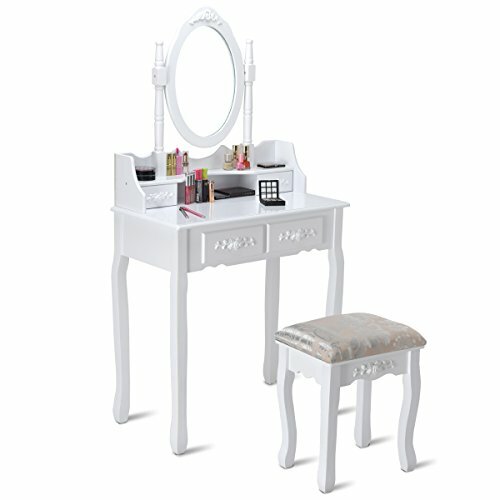 This is our brand new dressing table set with glamorous and elegant style ,which is the first choice for every girl. Made of wood panel and paulownia wood leg, this dressing table will be sturdy and durable for long time use .This dressing table set includes a mirrored dressing table with Four drawers and a stool. The stool has a really comfortable top. When you are sitting on it and dressing yourself, you will feel that it's really an enjoyment. The table with mirror and drawers is of great value. The mirror has a round shape, in front of which you can well make yourself up. And a lot of things can be stored in four storage drawer and the spacious table top. What a perfect dressing table set! Don't hesitate! Come and buy one! 『Sufficient Storage & Display Space』: The vanity tabletop is spacious enough to offer you ample space for storing or displaying your cosmetics, jewelry or decorative stuff. Two small top drawers under the mirror and two bigger drawers are easily pulled out or pushed in and are designed for storing your jewelry. 『360 Degree Rotatable Round Mirror』: The mirror stand is firmly installed on the table top and strongly supported by two beautiful wood poles. The size of the mirror is appropriate for you to watch your makeup or dress and perfectly suit the height of stool. The mirror can freely rotate 360 degree to suit for your sitting posture. 『Elegant and Modern Design』: White color and clean line looks elegant and stylish. Simplicity makes you feel fresh and natural and match any decoration of your room or home. Curved legs adds resin factor and add strong sturdiness to the table and stool. 『Multifunctional Usage』: Equipped with top mirror, this table can work as a functional vanity dressing table. The top mirror can be removed and then the table can serve as a perfect nightstand in your bedroom and office table in your home study. 『One Padded Stool Included』: The stool is padded with high-density sponge and decorated with beautiful flower pattern. Height of stool legs perfectly matches that of table and mirror. It can be single used if you need.